Distribution: Collectively, phytoplankton grow abundantly in oceans around the world. 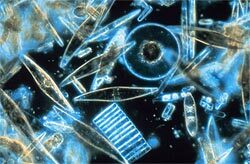 Description: Phytoplankton are microscopic plants that live in the ocean. Like all plants, phytoplankton use the pigment chlorophyll to convert sunlight into food. Phytoplankton differ from land-based plants in that they do not have roots, stems, or leaves.There are many species of phytoplankton, each of which has a characteristic shape. Habitat: Because phytoplankton photosynthesises they must therefore live in the well-lit surface layer (termed the euphotic zone) of an ocean, sea, lake, or other body of water. Through photosynthesis, phytoplankton are responsible for much of the oxygen present in the Earth's atmosphere. Two-thirds of all the photosynthesis that takes place on this earth occurs in the oceans that yearly creates 80 to 160 billion tons of carbohydrates. As the primary producers phytoplankton are at the base of the oceanic food web, Very abundant phytoplankton include the diatoms and dinoflagellates. Among the most abundant are the diatoms. Some 20,000 species make up this plant group. Under favorable conditions, a single diatom can reproduce 100 million offspring in a month. Diatoms are essentially cool water inhabitants, their counterparts in tropical waters are the dinoflagellates. Interesting facts: In addition to acting as the base of the food chain, phytoplankton play an essential role in the global carbon-cycle. During photosynthesis phytoplankton remove carbon dioxide from sea water, release oxygen as a by-product, and store the carbon in the form of organic materials. This process reduces the concentration of carbon dioxide in sea water. As a result, the oceans absorb additional carbon dioxide from the atmosphere. In a sense, the phytoplankton create a temporary "carbon sink" into which the world can pour its excess atmospheric carbon. Unfortunately, the world produces vast amount of carbon dioxide whether or not the phytoplankton and land plants are healthy enough to absorb it. When they die, phytoplankton sink to the ocean floor, carrying with them much of the carbon stored in their cells. The carbon in the phytoplankton is gradually covered by other materials sinking to the ocean floor. In this way, the oceans act as a kind of global carbon dump. No one yet knows how much carbon the oceans and land can absorb. Nor do we know how the Earth's environment will adjust to increasing amounts of carbon dioxide in the atmosphere. Studying the distribution and changes in global phytoplankton using ocean color and other tools will help scientists find answers to these questions. Status: Since phytoplankton depend upon certain conditions for growth, they are a good indicator of change in their environment. For these reasons, and because they also exert a global-scale influence on climate, phytoplankton are of primary interest to oceanographers and Earth scientists around the world. Scientists believe that the sun’s radiation in the Arctic and Antarctic is killing off many species of plankton including phytoplankton. They die because phytoplankton are extremely sensitive to the sun’s radiation.